What exactly pilots are being paid? Pilot profession has always been recognized not only as a prestigious and exclusive, but also as a well paid one. Growing demand and global expansion of aviation sector makes it the perfect environment for ambitious and prosperous career development. 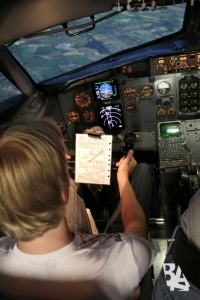 Many may argue that aviation education is a high financial obligation that may or may not be financially beneficial. BAA Training decided to look into the actual wages the pilots are being paid and what other measures should be taken into consideration. In regards to pilot salaries, it is crucial to consider the region where the pilots are being employed and the aircraft type they are going to fly. The predominance of the certain aircrafts in certain regions creates a certain demand for the pilots, which both influence the pilot pay. In addition to that, the pilot experience also plays a major part in pay rate. According to the United Kingdom (UK) official graduate career website prospects.ac.uk pilot salaries in United Kingdom for a newly qualified First Officer working for a small operation may be around 32,100 $ a year. While working with larger companies starting salaries can be around 34,000 $ – 37,000 $ a year. Salaries for more experienced pilots could range from 55,000 $ to 73,000 $ in a First Officer role. Salary for a Captain position with a medium-sized airline may range from 87,000 $ to 120,000 $, while those with the major operators could earn from 150,000 $ to more than 210,000 $ per year. According to the Pilot Salary study 2012, where survey respondents have been gathered from such USA airlines as Delta, Airtran, Alaska, Fedex, United, Jet Bleu and others, the First Officer average annual pay in USA, based on 80 hrs per month and size of aircraft, is about 42,000 $. The First Officer with 5 year experience may reach 102,000 $ a year. Once you upgrade to Captain, you can expect to make in 150,000 $ range annually, while and at some major airlines and cargo carriers about $190,000 per year. Analysing the salaries, the aircraft type has an influence on the salary as well as the region. For example according to the USA Pilot Salary study 2012, the First Officer of Boeing B 737 may get from 29,000 $ up to 55,000 a year, while Senior First Officer may get up to 123, 000 $ and Captain position depending on years of experience can get up to 201,000 $ a year. At the same time being a First Officer of the Airbus A320 you may get about 30,000 $, Senior First Officer up to 85,000 $ and for Captain position from 120,000 up to 150,000 $ pay a year. Taking a position of EMB 190 pilot the annual salary may range from 45, 000 $ up to 133, 709 depending on the position and experience. Supermidsize jets like Embraer Legacy – 122,000 annual average pay. The midsize jets Hawker 600/700 or Hawker 8000/800 XP/1000 average annual pay varies from 92,000 up to 110,000 $. Asia now stands as the fastest growing region for aviation in the world. Starting salaries for a three-year commitment range between $16,000 and $18,000 per month, translating to just under $200,000 per year. According to the job advertisements placed by various China Airlines at chinavaitionrecruitment.com the salary for EMB 190 Captains position may start at 15,700 $ per month what makes 188, 400 $ per year. The Captain of Airbus A320 is offered a 14,500 $ fee per month, or 174,000 $ per year. The First Officer for Airbus A320 may get starting from 100, 000 $ per year. Captain of Boeing B777 is offered 182,000 $ per year, while captain for Cargo Boeing B747-400 up to 250,000 $ per month. Whether you decide to work in the east or the west – high quality training is essential to secure a great job position. BAA Training working under JAA/EASA requirements offers a wide range of high quality aviation training. Training course completion certificates issued byBAA Training are valid in the European Union, Israel, Ukraine, Kazakhstan, Kyrgyzstan, Tajikistan, Belarus, Afghanistan, China, Philippines and Brazil. In addition to that BAA Training being a part of Avia Solution Group has partnered with a number of different partners to do its best to enable its students to develop and grow professionally and secure a well paid dream job of a pilot.